Send 12 sensational long stem Roses to your loved one. Pick a different colour option to express what you feel; white, yellow, apricot, pale pink, blushing pink, coral, scarlet, deep red, pink rimmed white and more - every coloured rose can convey your special message, whether it be to a man or a woman.The vase pictured is not included, however to upgrade your gift, you can choose between 3 vases; Standard, Premium and Superior. 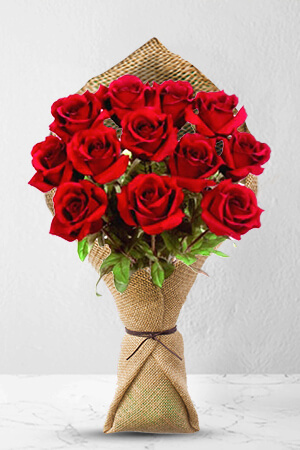 We recommend a Premium Vase for these beautiful Roses. A card rather than a piece of paper stuck on with the message would have been a little more impressive. Easy effortless ordering, delivery timing was excellent, and the flowers were fantastic! Thank you! User friendly. How about using Paypal as one of your pay options? My bank charges me too much for international transactions.